Pistons, Rings, Rods & Parts. 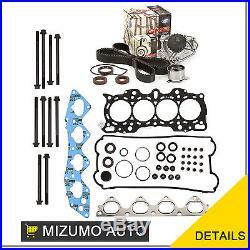 Head Gasket Set Timing Belt Kit Water Pump Fit 97-01 Honda B20B4 B20Z2. Guaranteed to fit and meet the specifications of the OE parts being replaced. 24/7 Support Ask product experts. Replace Part #: 14400-P7J-004, 14510-P30-003. Located in the engine compartment behind the drive belts, the timing belt keeps the crankshaft in sync with the camshaft(s), essentially ensuring the proper timing and operation of the engine and its valves. When replacing a timing belt, also replace tensioner, and pulleys. Failure of pulleys and tensioners, after replacing only the belt, can cause valve or piston damage and lead to more expensive repairs. Additionally, timing belt driven water pumps should also be replaced at the same time as the timing belt. Operated by the drive belt, the water pump's core function is to allow coolant to flow into the engine continually. Together, these three components: timing belt, tensioners and pulleys, and the water pump are essential to the overall health of your engine. Ignoring the replacement of a timing belt as a part of scheduled maintenance could result in major engine failure down the road. Be sure to use our aftermarket replacement timing belt kit when the timing belt is serviced for the best performance. Multiple Layers Steel (MLS) Head Gasket. 10 Cylinder Head Bolts (2 Long Bolts, 8 Short Bolts). 1 Timing Belt (125 teeth). 1 GMB Tensioner Roller (bearing assembly). 2 Camshaft Seals (27 x 43 x 9). 1 Front Crankshaft Seal (38.5 x 50 x 7.5). GMB is one of largest global manufacturers of OE and Aftermarket automotive products. Since 1943, GMBs manufacturing quality has been recognized within the industry beginning with Tensioner and Idler Bearings, Water Pump, Universal Joints. Over the years GMB manufacturing quality expanded into a variety of quality parts now including Wheel Bearings and Hub Assemblies, Fuel Pumps, Fan Clutches, and Steering & Suspension parts. Mizumo Auto is located in Southern California, the most diversified import automotive market in the nation, thus, allowing the company to continually study market trends to help forecast future product needs, and enhance development to exceed industry standards of both quality and performance. Mizumo Auto offers national sales and support services along with a fast program to insure our clients get the parts they need now. The item "Head Gasket Set Timing Belt Kit Water Pump Fit 97-01 Honda B20B4 B20Z2" is in sale since Monday, August 1, 2016.